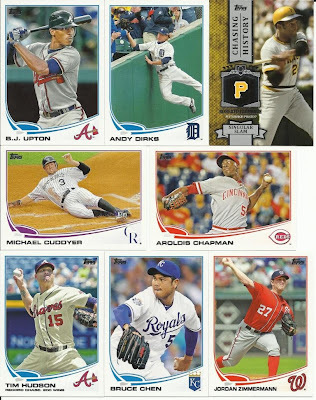 Tonight, I am opening a pack of 2013 Topps Hobby Series 2. 10 cards per pack. Look for the draft later. Congratulations to the managers who snapped up players out of this pack! We also have a couple free agents that will make an appearance in tonight's draft. The Clemente card was worth the wait. Nice bit o' 'board there.